Russian icon of the Kazan Mother of God. Icon with darkly painted faces (would likely benefit from cleaning) under a silvered oklad decorated with flowers, shells and leaves. Unsigned. Velvet back on wooden panel. 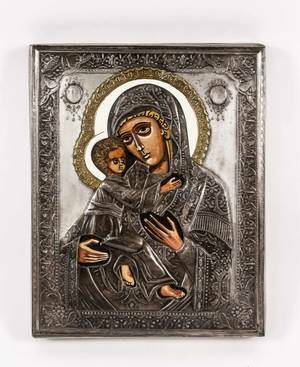 This icon has not been examined with the oklad removed. 7.9" x 6.5". Russian icon gilded mother of god with brass cover and removable oklad, dated 1852. 11 3/4" x 14 1/4"